If you’re looking for the best life insurance companies in Bangladesh then this is the best place where you’ll get most about the issue. Life Insurance Company depends on their micro business capital security in the developed or developing countries. As a trusted and famous Insurance Company increase confidence level to the countries people for make entrepreneurship, it’s an innovative idea in their business. Although Bangladesh was a poor country, now it’s a developing country and it is continuing to develop. And we’re also expecting more development gradually of the economy and the country’s overall context. As local people have got more awareness about the security of what they belong, insurance service in Bangladesh is developing. Because it has established the trust and people of Bangladesh turn to them on and on with optimism, promising service of some companies. Despite the low penetration rate, Bangladesh insurance market is in an upward trend. As opined by the insurance expert from home and aboard, it has potentialities to growth and advancement. Also, the insurance professionals of the country require insurance information associated with Bangladesh insurance market quite often. Because on this page we have just attempted to compile information from reliable sources, you’ll get enough food for knowledge in your way to know about the Bangladesh insurance industry. From agricultural to the services sector, the Economy of Bangladesh has rapidly been shifting. When the role so played by the service sector is burgeoning as well, insurance is one of the ingredients of the financial services industry has a lot to play if it is promoted properly. The insurance industry was nationalized in 1972 following the independence of Bangladesh in 1971. However, it’s still near to the ground owing to the fact that industry is faced with the challenges for the insurance penetration in comparison with neighboring countries. In number and the quality, there are many best life insurance companies in Bangladesh. According to the authority, the insurance company is that any insurer being a company, partnership or association which may be wound up. As there are many companies in Bangladesh those who are doing the business, we try to order them in the top five. From life insurance to car and general insurance, there are almost all types of insurance in Bangladesh. As it’s working from 1952, the American Life Insurance Company (ALICO) is one of the earliest insurance companies in Bangladesh. Although the company comes from America, they have successfully adapted it to suit the needs and expectations of Bangladeshi people. Also, they have reached the top position in the country. Because more than a million Bangladeshis depend on it with thousands of agents working for them, it has created local jobs. 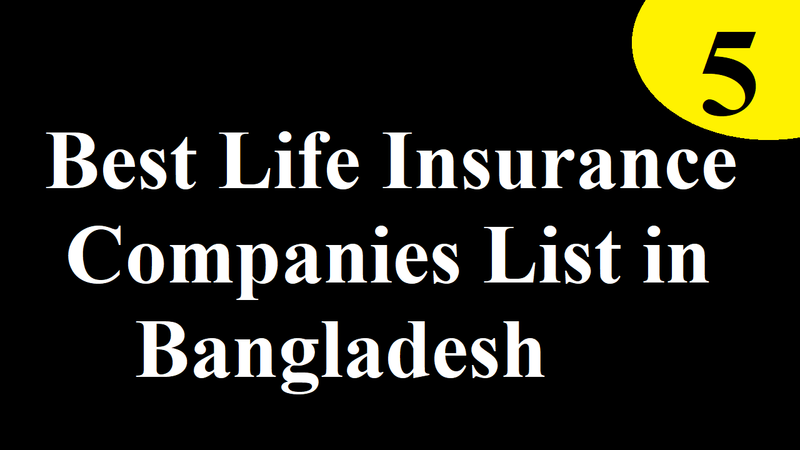 These have taken it at the top position in the country as one of the best life insurance companies in Bangladesh. This way it has established a very effective network to work with the entire nation via its officers while working particularly well in the individual insurance policies. As a state-owned insurance company, Jiban Bima Corporation is providing life and other kinds of insurance services to citizens. In this case, the term Jiban and Bima mean Life Insurance in Bengali, which is the official language of Bangladesh. Although the company is located in Dhaka, Jiban Bima Corporation has branches all over Bangladesh and touches millions of people every day. This is because many people in Bangladesh prefer to buy policies from Jiabn Bima as it’s a government organization. Apart from these, it has created a wide range of plans to suit people in all economic groups, which has proved to be a big success. Delta Life Insurance Company Limited was established in 1984 when the Bangladesh Government allowed private sectors in the insurance industry. The company was started by a number of Bangladeshi citizens then working abroad because they wanted their fellow citizens to get the top class insurance services which are common in western countries. Delta life insurance has been working with the same goal in mind and it’s growing to a large organization at the moment from their first day. As they have designed plans for keeping the expectations of the society in mind, this is the primary reason for their success. Also, there is another reason for their success is that they work with people from all backgrounds as well as provide services to all kinds of individuals and corporate organizations. With the goal of reaching every insurable citizen in Bangladesh, this unique organization started its journey. Despite being many companies, they didn’t have means to reach out to all of them. While designing unique schemes and campaigns to bring everyone under their protection, they achieved this. Also, along with providing a number of schemes which focused on the direct benefits, they have achieved it. The essential reason for doing insurance that they indirectly provided the protection. That’s why they are so popular across the country. Apart from these, they have hundreds of agents who are working with the public directly to ensure the movement is constantly moving forward. Since it’s creating a change in the society by their ‘micro insurance’ segment, Shandhani Life Insurance Company Limited is operating for 25 years. Due to higher costs, the common people may not buy insurance. But, Shandhani life insurance approached them with smaller policies that they are able to buy. And as they grow socially and economically, it would bring them to the regular fold. This way, the company reached out to hundreds of thousands of poor people with this focus. And while keeping the focus on the big customer, this approach has helped this company to reach the top position with a great impact on the society.